Thanks Giving and Christmas time always seem to sprout a lot of new ideas and adventures. Before gifts are opened there is usually an exchange of the most recently tried and tested productivity Apps. Its great because while we try to stick to a no shop talk rule, its refreshing changing out ideas that, (at Grimmster anyways,) I wouldn’t normally entertain. When you do tech for a living you can always seem to find a way to spill over into work which can cause a very blurry line in the health life-work balance. So its kinda of cool as it allows for an open mind, especially when I get together with my brother Larry who has helped us out with our hardware stuff for several years. This year between some awesome food and some nice gifts we had fun exploring an new idea. While we always play with the toys, bike and boards etc, this year the RC Stuff took a front step. 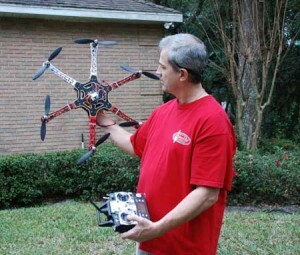 In this picture Lawrence is holding on to 6 rotor RC Helicopter that he has been playing with for a while. Playing with electronics has been a passion of his since the single digit years. I did so as well but only off and on. Put it this way, my landings and take off were quite a bit rougher than his. However this backyard fun has lead new a new aspect of our business in 2013 where we will be starting to produce a Series of videos as part of Grimmsters new Education and Development expansion. Much more on this soon to come. For now we are doing some building, and testing our new Aerial Video System. Stay tuned for news about Grimmster Education and Development TV. We will be doing some cool stuff this year to take Web Development and Online Marketing to a new level.